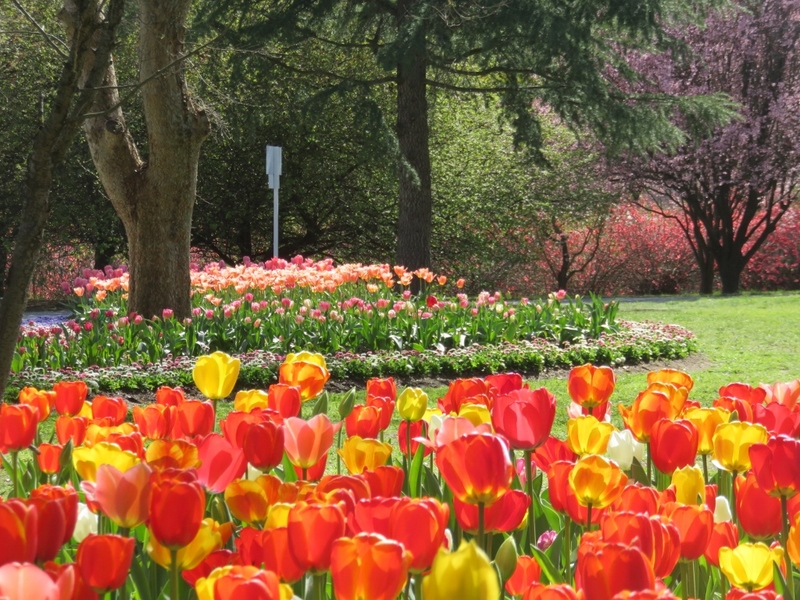 Can you believe this stunning property, called Tulip Top, is designed, planted and cared for by two people… Pat and Bill Rhoden. 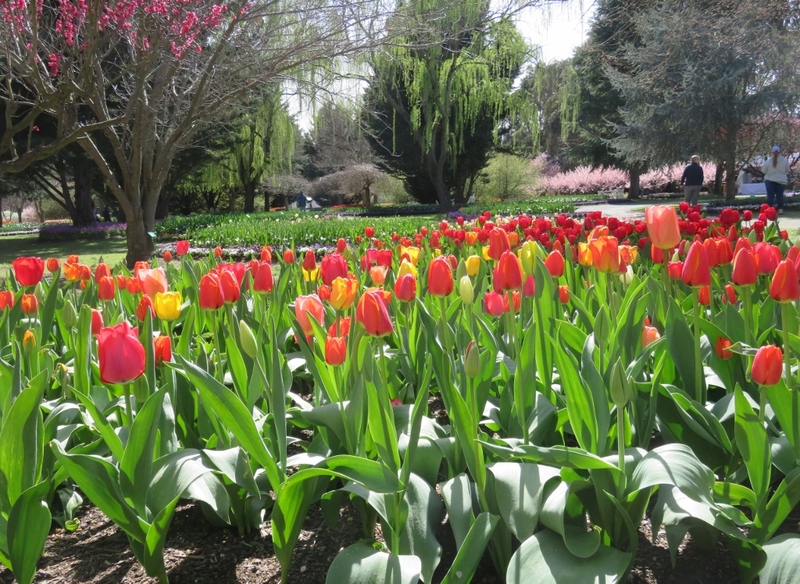 Twenty years ago, when they lived in Canberra, Pat and Bill had won awards for their suburban garden…so when they retired they decided to find a bigger property and to really indulge their passion for gardening. 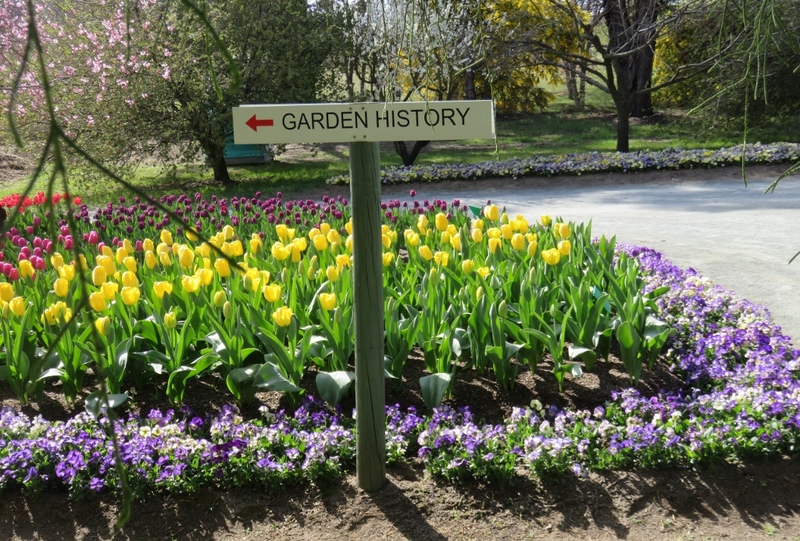 They now have a wonderful spring garden on 10 acres (four hectares) just north of Canberra at Sutton. 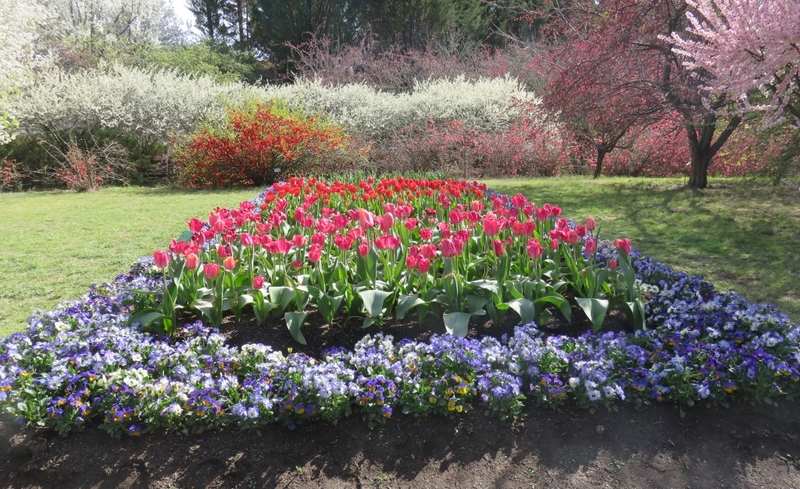 It seems incredible to me that Pat and Bill manage this property on their own, their son helps with some gardening, and their daughter organises the administration when Tulip Top opens in spring. ……so I can just stop complaining about my knees after a day of gardening! 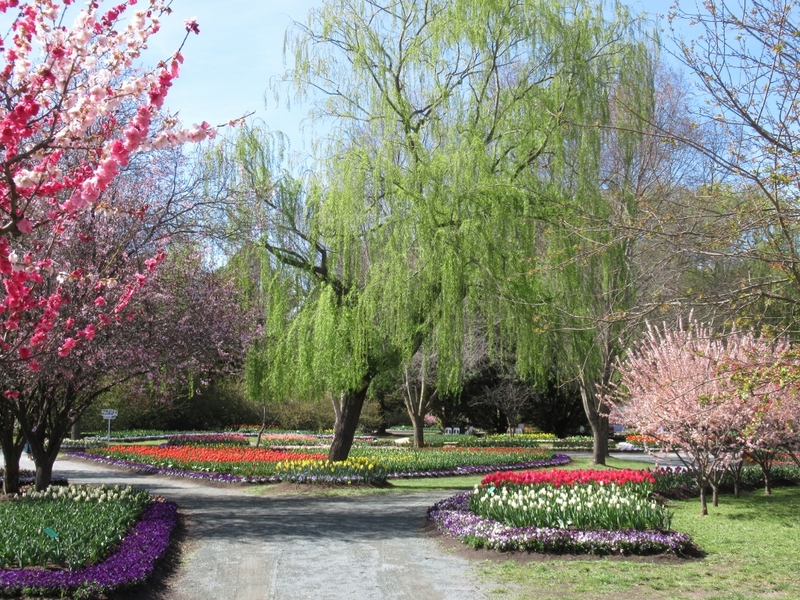 Twenty years ago they began by planting various trees. To form a canopy for the garden they have English and Chinese elms, conifers (excellent wind breakers) and eucalyptus trees are all in the mix..
Weeping willows give an early spring lace green effect.. 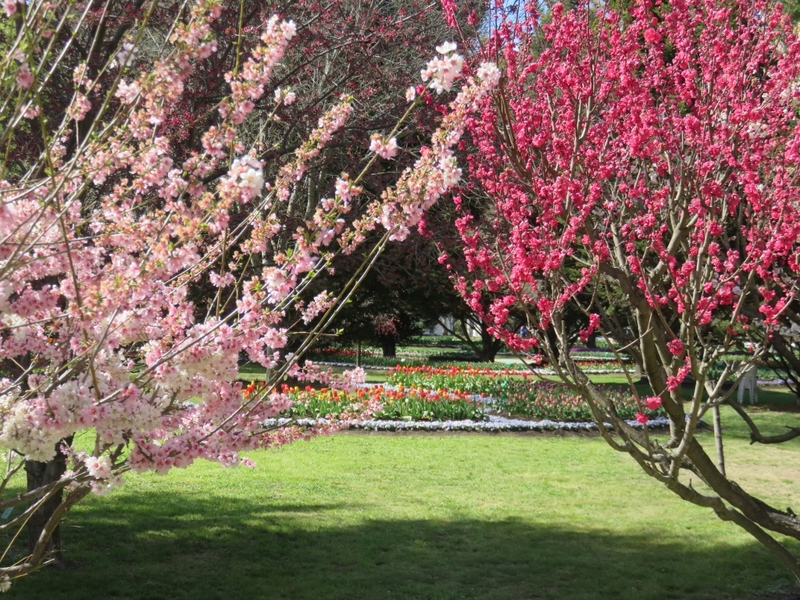 They have crab-apple, peach, cherry, apricot, quince and plum trees. 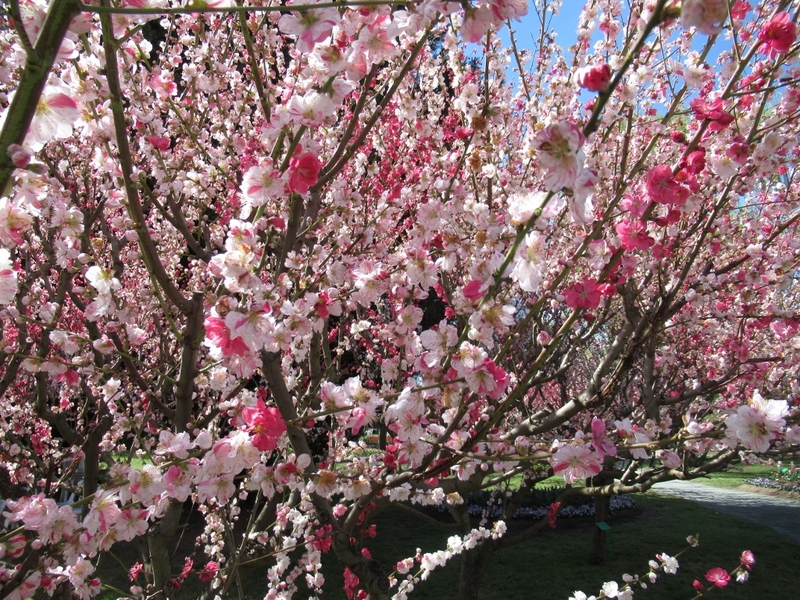 A particularly eye-catching tree is the Double Flowering Peach tree.. 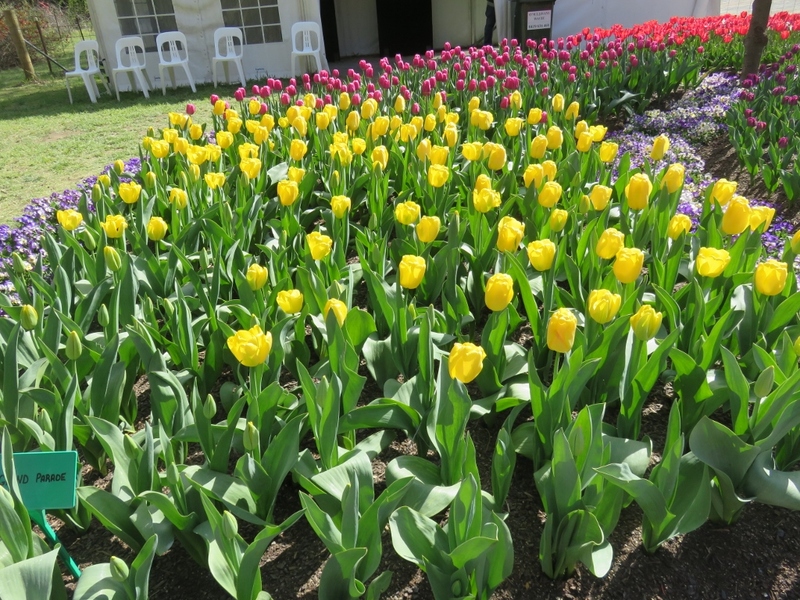 The Australian Garden History Society has showcased the progress in the garden with photos and articles near the entrance to the gardens..
…here is a short summary of Pat and Bill’s year of gardening.. 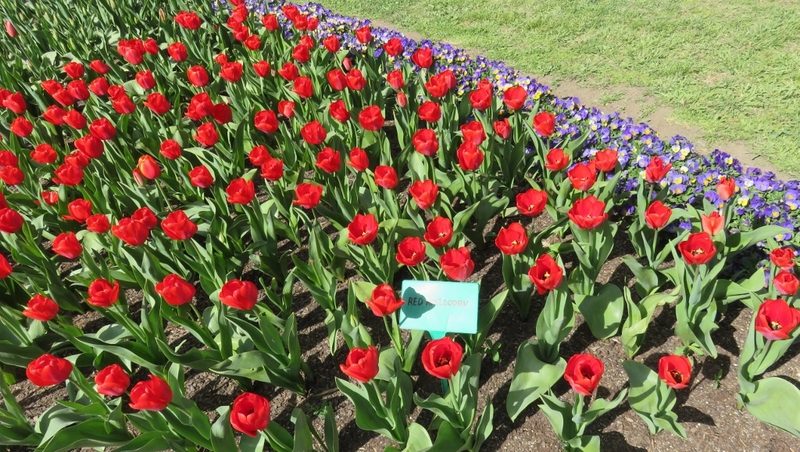 In November they lift the bulbs, which are labelled and stored in crates. 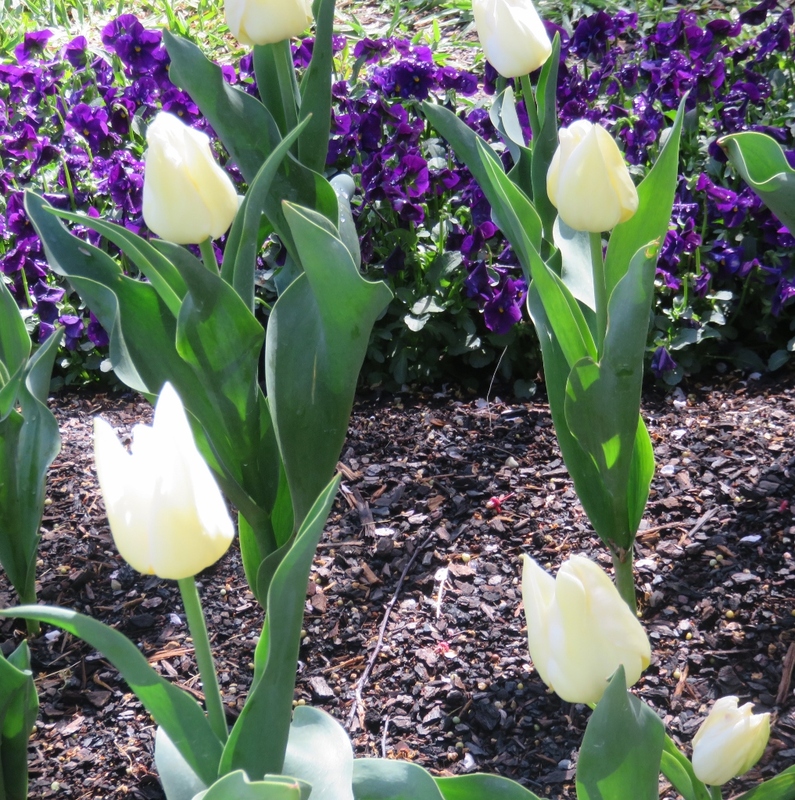 (500 000 bulbs at last count). Then two weeks worth of pruning trees..
After a Christmas and holiday break, Pat and Bill begin again in February. 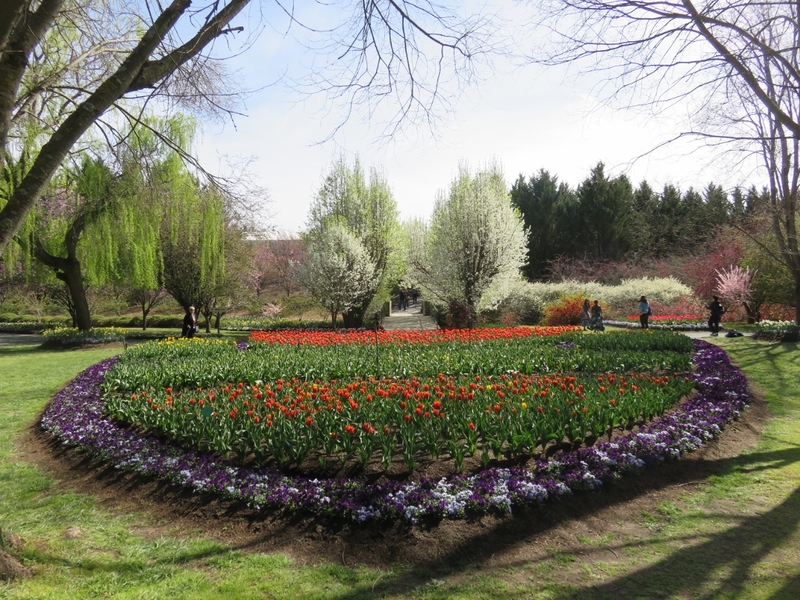 They re-shape the beds, add fertilizer, and make sure the PH in the soil is right. 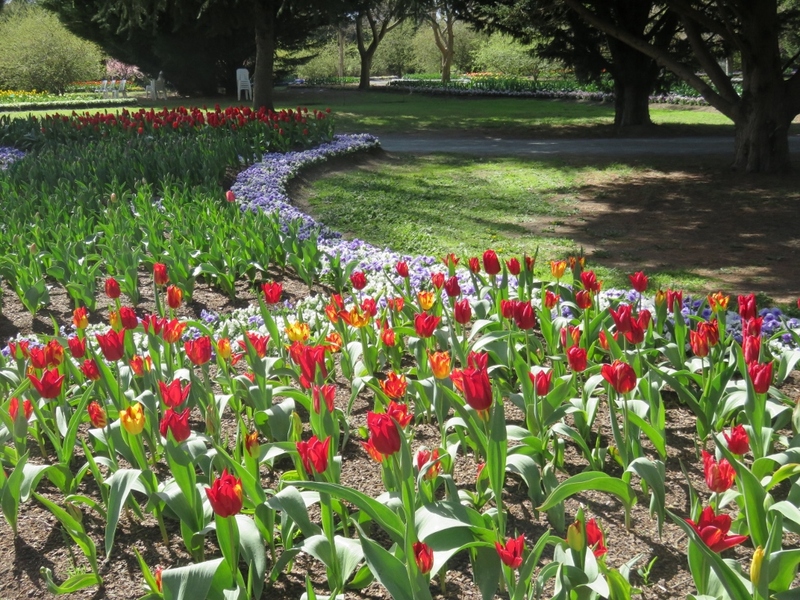 They check bulb catalogues, and trial about 10 to 12 new cultivars each year. 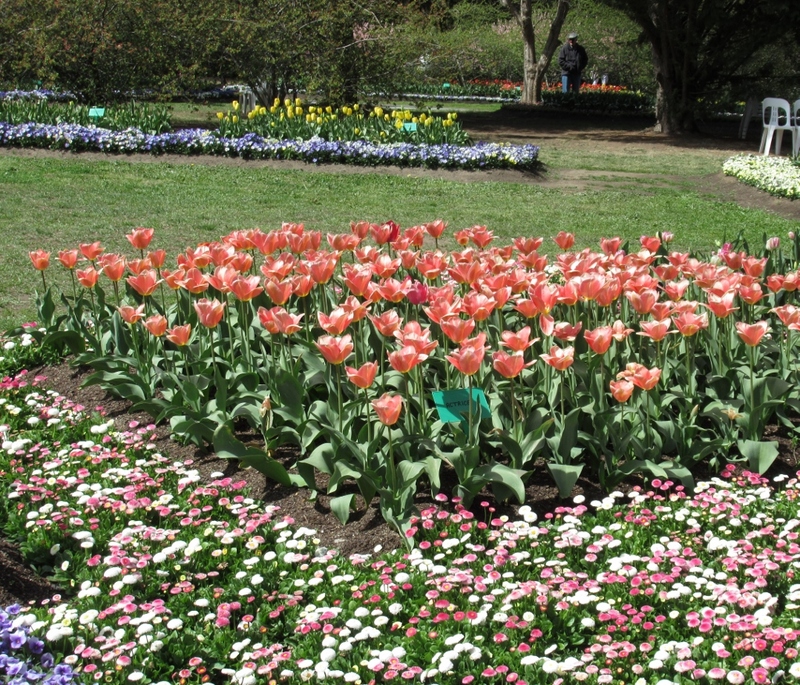 In mid March seedling trays of annuals arrive, including pansies, primulas, and English Daisies, amongst others. 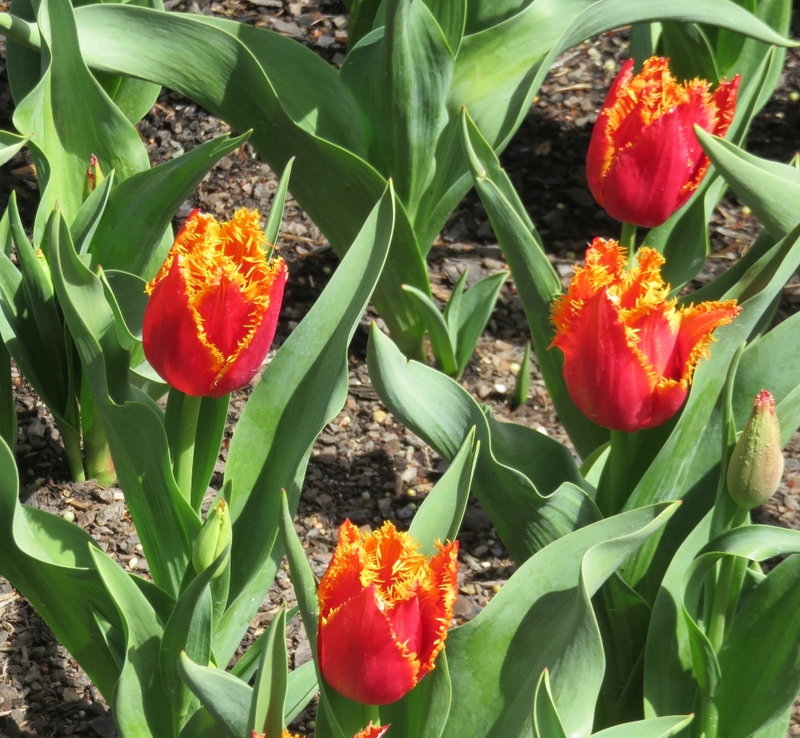 In early autumn the tulips go into cold storage. 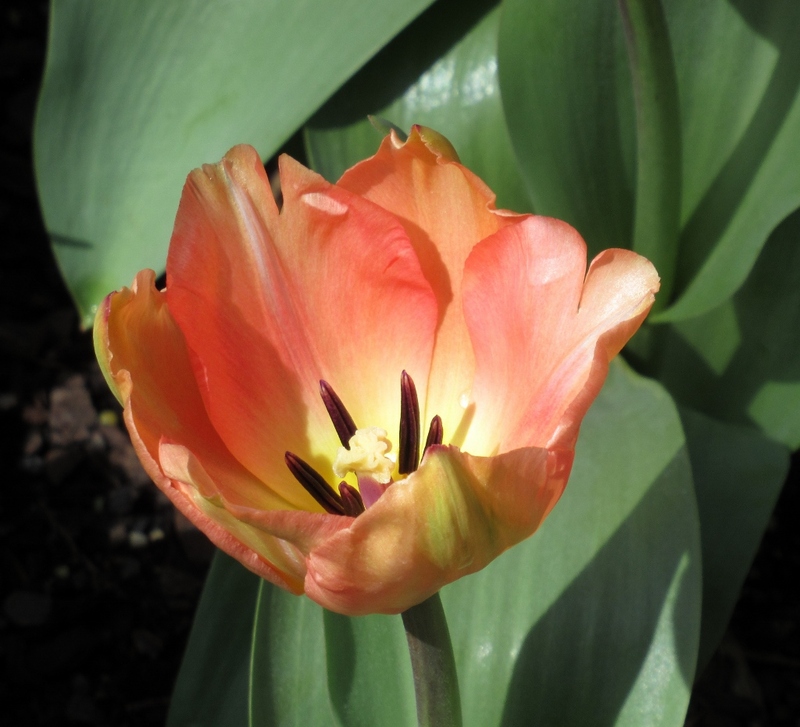 Tulip planting begins in May for a six week period….right into our winter, June. As they can’t plant until the soil thaws in the winter mornings, Bill says sometimes they have to work in the dark to make deadlines. 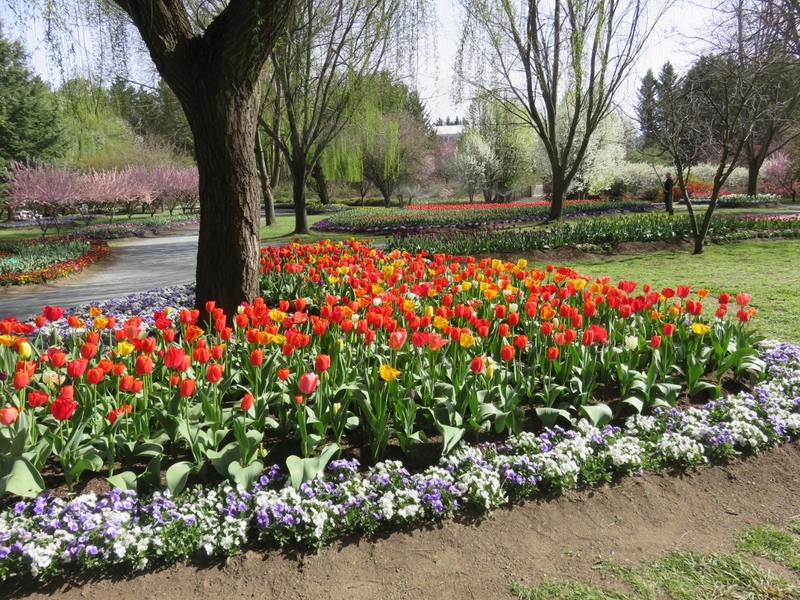 Tulips are planted en masse, with early, mid and late varieties. Everything is covered in sugar cane mulch…this offers protection against the birds and frost, and saves on watering and keeps the weeds down..
Pat says that World Favourite has always been a good performer for them. 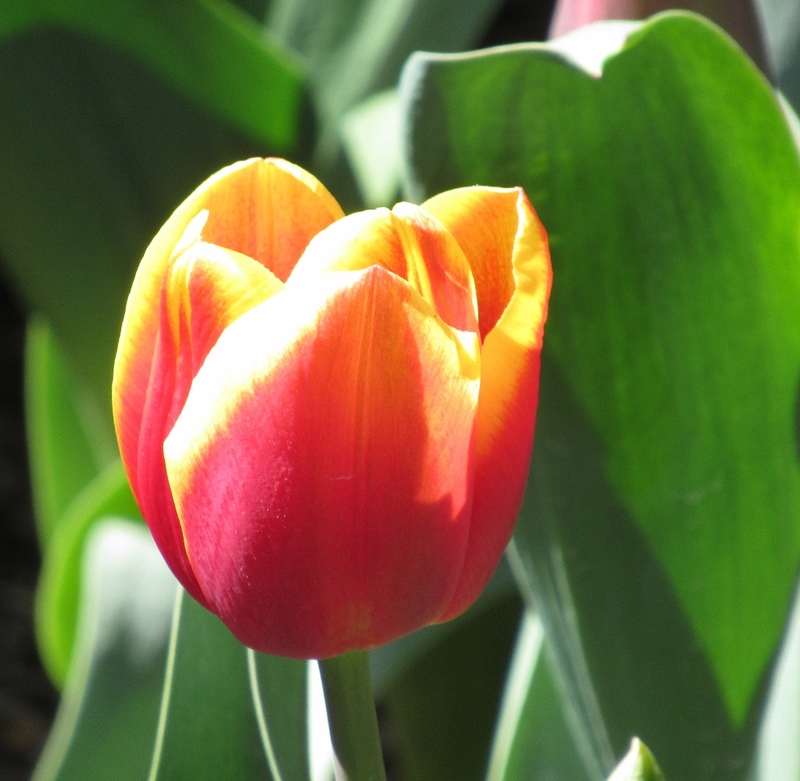 In the evening light, the red and yellow tulip looks as there is a light burning inside it. 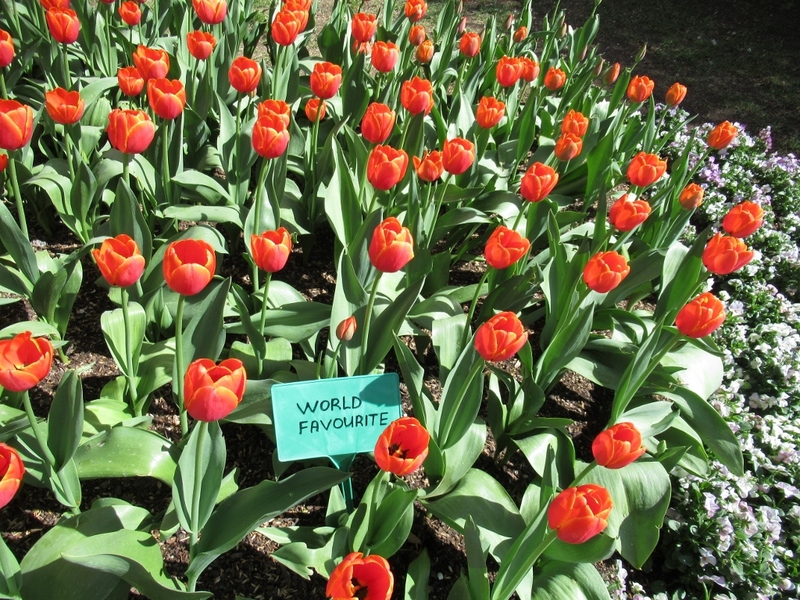 Do you have a favourite tulip? 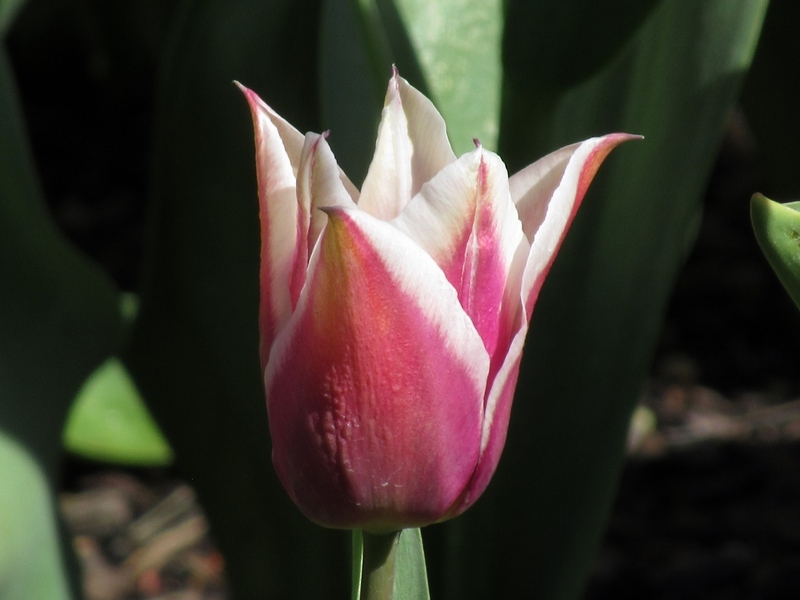 I just love all red tulips, and they bloom in the most difficult parts of our garden..
…..and if you are looking for some bling, how about this one, aptly named Fabio! Many thanks to Bill and Pat for a wonderful day.. 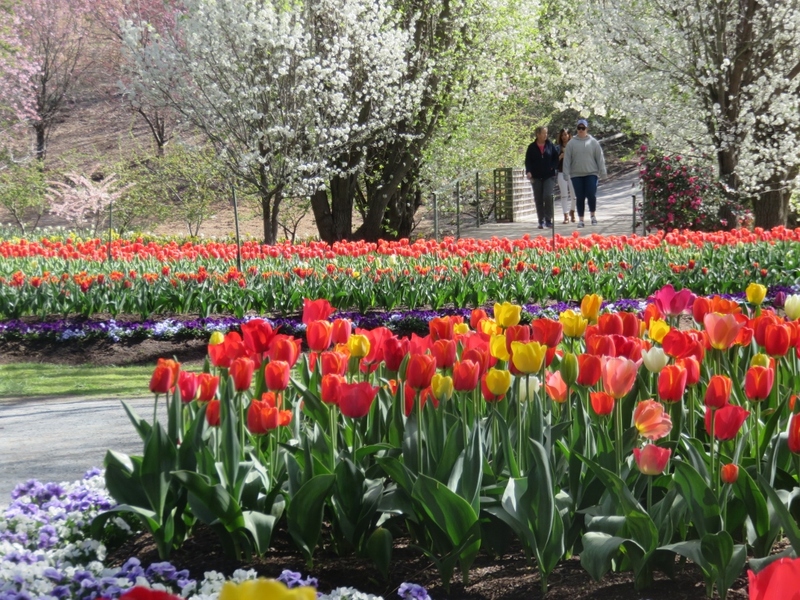 This entry was posted in Canberra's Public Gardens, New South Wales Gardens and tagged annual flowers, spring Canberra, Tulip Tops, tulips daffodils on September 30, 2018 by germac4.